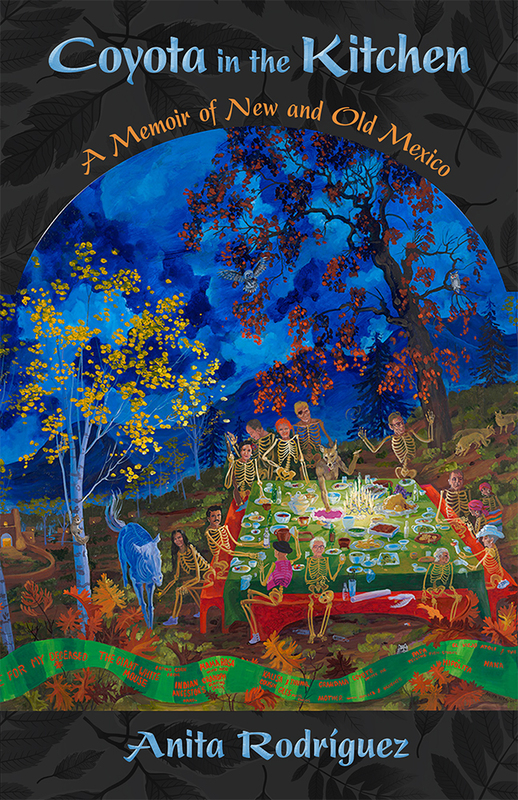 This book of stories and recipes introduces two eccentric families that would never have eaten together, let alone exchanged recipes, but for the improbable marriage of the author’s parents: a nuevomexicano from Taos and a painter who came from Texas to New Mexico to study art. Recalling the good and the terrible cooks in her family, Anita Rodríguez also shares the complications of navigating a safe path among contradictory cultural perspectives. She takes us from the mountain villages of New Mexico in the 1940s to sipping mint juleps on the porch of a mansion in the South, and also on a prolonged pilgrimage to Mexico and back again to New Mexico. Accompanied by Rodríguez’s vibrant paintings—including scenes of people eating on fiesta nights and plastering an adobe church—Coyota in the Kitchen shows how food reflects the complicated family histories that shape our lives. Anita Rodríguez is an award-winning painter who is also widely known as an enjarradora, or plasterer and finisher of adobe buildings. She lives in Taos, New Mexico.